Cartography or mapmaking (in Greek chartis - map and graphein - write) is the study and practice of making representations of the Earth on a flat surface. 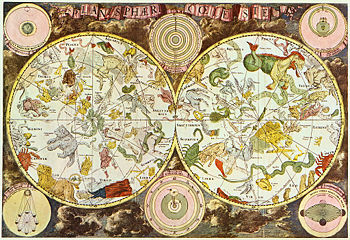 The discipline of cartography combines science, aesthetics, and technical ability to create a balanced and readable representation that is capable of communicating information effectively and quickly. Cartography, however mechanized it becomes, remains both a science and an art. The aesthetics of any given map will always be a critical component essential to the conveyance of information. A map must provide accuracy and in the best of solutions, an inventive presentation of data or analysis of data, but always in a form that is readily comprehensible and inviting to the reader. A map is both more, and less, than simply geographical or physical space. And it is always a result of artistic and technical judgments, creating something both useful and, occasionally, beautiful. Maps of all scales have traditionally been drawn and made by hand, but the use of computers has revolutionized cartography. Most commercial-quality maps are now made with software that falls into one of three main types: CAD, GIS, and specialized illustration software. Maps have been a large part of the human story for a long time (perhaps 8,000 years - nobody knows exactly, but longer than written words). They were known to have existed in societies of Europe, the Middle East, China, India, and others. The earliest known map to date is a wall painting of the ancient Turkish city of Çatal Hüyük which has been dated to the late seventh millennium B.C.E. Other known maps of the ancient world include the Minoan “House of the Admiral” wall painting from c. 1600 B.C.E. showing a seaside community in an oblique perspective, and an engraved map of the holy Babylonian city of Nippur, from the Kassite period (fourteenth – twelfth centuries B.C.E.). The ancient Greeks and Romans created maps beginning with Anaximander in the sixth century B.C.E. In ancient China, although geographical literature spans back to the fifth century B.C.E., the drawing of true geographical maps was not begun in earnest until the first half of the Han Dynasty (202 B.C.E.-202 C.E. ), with the works of Prince Liu An (179 B.C.E.-122 B.C.E.). Mappa mundi is the general term used to describe Medieval European maps of the world. Approximately 1,100 mappae mundi are known to have survived from the Middle Ages. Of these, some 900 are found illustrating manuscripts and the remainder exist as stand-alone documents . In the Age of Exploration from the fifteenth century to the seventeenth century, cartographers copied earlier maps (some of which had been passed down for centuries) and drew their own based on explorers' observations and new surveying techniques. The invention of the magnetic compass, telescope, and sextant increased accuracy. In cartography, new technology has been incorporated into the production of the maps of new generations of mapmakers and map users. The first maps were manually constructed with brushes and parchment, were varied in quality and of limited distribution. The advent of magnetic devices, like the compass and, much later, magnetic storage devices, led to the creation of far more accurate maps and the ability to store and manipulate those maps digitally. Advances in mechanical devices such as the printing press, quadrant, and vernier calipers allowed for the mass production of maps and the ability to make accurate reproductions from more accurate data. Optical technology, such as the telescope, sextant, and other devices that use telescopes, allowed for accurate surveying of land and gave the mapmakers and navigators the ability to find their latitude by measuring angles to the North Star at night or the sun at noon. Advances in photochemical technology, such as the lithographic and photochemical processes, have allowed for the creation of maps that are finely detailed, do not distort in shape, and resist moisture and wear. These advances eliminated the need for engraving, further shortening the time it takes to make and reproduce maps. In the late twentieth century and early twenty-first century, advances in electronic technology led to another revolution in cartography. Specifically, computer hardware devices such as computer screens, plotters, printers, scanners (remote and document), and analytic stereo plotters along with visualization, image processing, spatial analysis and database software, have democratized and greatly expanded the making of maps. The ability to superimpose spatially located variables onto existing maps created new uses for maps and new industries to explore and exploit these potentials. The field of cartography can be divided into two broad categories: general cartography and thematic cartography. General cartography involves those maps that are constructed for a general audience and thus contain a variety of features, like topographic maps. Topographic maps depict natural and built features of a place, with relief and elevation shown by drawn contours or shading techniques. These relatively general maps exhibit many reference and location systems and often are produced in a series. For example, United States Geological Survey (USGS) has produced a full series of 1:24,000 scale topographic maps; Canada has the same, at 1:50,000 scale. The government of the UK produces 1:63,360 (1 inch to 1 mile) "Ordnance Survey" maps of the entire UK and a range of correlated larger- and smaller-scale maps of great detail. Thematic cartography involves maps of specific geographic themes oriented toward specific audiences. Examples might be a dot map showing corn production in Indiana or a shaded area map of Ohio counties divided into numerical choropleth classes. As the volume of geographic data has exploded over the last century, thematic cartography has become increasingly useful and necessary to interpret spatial cultural and social data. Epidemiological data are represented on specialized maps, a particularly useful way to illustrate exposure patterns, or occurrence. Most applied cartography could be well be described as thematic mapping. Points of view can be represented thematically as well, and the user of a given map must be informed of the objectives of the cartographer in order to judge the value of the presentation. From the very beginning of mapmaking, maps "have been made for some particular purpose or set of purposes." The intent of the map should be illustrated in a manner in which the 'percipient' acknowledges its purpose in a timely fashion. The term percipient refers to the person receiving information and was used by Robinson. The figure-ground principle refers to this notion of engaging the user by clear presentation, leaving no confusion concerning the purpose of the map. Clear presentation enhances the user’s experience and keeps his attention. If the user is unable to identify what is being demonstrated, the map may be useless. Making a meaningful map is the ultimate goal. MacEachren explains that a well designed map "is convincing because it implies authenticity" . A thoughtfully designed, interesting map engages a reader. Information richness or a map that is multivariate will show relationships within the map. Showing several variables allows comparison, adding to the meaningfulness of the map. This also generates hypotheses, stimulates ideas, and perhaps, further research. In order to convey the message of the map, the creator must design it in a manner that will facilitate the overall understanding of its purpose. The title of a map may provide the "needed link" necessary for communicating that message, but the overall design of the map fosters the manner in which the reader interprets it ). Most maps use text to label places and for such things as a map title, legend, and other information. Maps are typically created in specific languages, though names of places often differ among languages. So a map made in English may use the name Germany for that country, where a German map would use Deutschland, and a French map Allemagne. A word that describes a place using a non-native terminology or language is referred to as an exonym. In some cases, the 'correct' name is unclear. For example, the nation of Burma officially changed its name to Myanmar, but many nations do not recognize the ruling junta and continue to use Burma. Sometimes an official name change is resisted in other languages and the older name may remain in common use. Examples include the use of Saigon for Ho Chi Minh City, Bangkok for Krung Thep, and Ivory Coast for Côte d'Ivoire. Difficulties arise when transliteration or transcription between writing systems is required. National names tend to have well established names in other languages and writing systems, such as Russia for Росси́я, but for many placenames a system of transliteration or transcription is required. In transliteration the symbols of one language are represented by symbols in another. For example, the Cyrillic letter Р is traditionally written as R in the Latin alphabet. Systems exist for transliteration of Arabic, but the results may vary. For example, the Yemeni city of Mocha is written variously in English as Mocha, Al Mukha, al-Mukhā, Mocca, and Moka. Transliteration systems are based on relating written symbols to one another, while transcription is the attempt to spell the phonetic sounds of one language in another. Chinese writing is transformed into the Latin alphabet through the Pinyin phonetic transcription systems, for example. Other systems were used in the past, such as Wade-Giles, resulting in the city being spelled Beijing on newer English maps and Peking on older ones. The quality of a map’s design affects its reader’s ability to comprehend and extract information from the map. 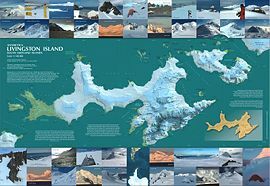 Cartographic symbolization has been developed in an effort to portray the world accurately and effectively convey information to the map reader. A legend explains the pictorial language of the map, or its symbolization. The title indicates the region the map portrays or the map's intent; the map image portrays the region and so on. Although every map element serves some purpose, convention dictates inclusion of only certain elements while others are considered optional. A menu of map elements includes the neatline (border), compass rose or north arrow, overview map, scale bar, projection, and information about the map sources, accuracy, and publication. When examining a landscape, scale can be intuited from trees, houses, and cars. Not so with a map. Thus a simple thing as a north arrow can be crucial; the top of a map does not necessarily indicate north. Color is equally important. How the cartographer uses color to display the data can greatly affect the clarity or intent of the map. Different intensities of hue portray the cartographer's various objectives. Computers can display up to 16 million distinct colors at a time even though the human eye can distinguish only a minimum number of these (Jeer, 1997). This allows for a multitude of color options for even for the most complex maps. Moreover, computers can easily hatch patterns in colors to give even more options. This can be very useful when symbolizing data in categories like quintile and equal interval classifications. Quantitative symbols give a visual measure of the relative size/importance/number that a symbol represents. There are two major classes of symbols used for portraying quantitative properties on a map: Proportional symbols change their visual weight according to a quantitative property. These are appropriate for extensive statistics. Choropleth maps portray data collection areas (such as counties, or census tracts) with color. Using color this way, the darkness and intensity (or value) of the color is evaluated by the eye as a measure of intensity or concentration . A good map is a compromise between portraying the items of interest (or themes) in the right place for the map scale used, and the need to annotate that item with text or a symbol, taking up space on the map medium and very likely causing some other item of interest to be displaced. The cartographer is thus constantly making judgments about what to include, what to leave out, and what to show in a slightly incorrect place - because of the demands of the annotation. This issue assumes more importance as the scale of the map gets smaller (i.e., the map shows a larger area), because relatively, the annotation on the map takes up more space on the ground. A good example from the late 1980s was the British Government Ordnance Survey's first digital maps, where the absolute positions of major roads shown at scales of 1:1250 and 1:2500 were sometimes a scale distance of hundreds of meters away from ground truth, when shown on digital maps at scales of 1:250000 and 1:625000, because of the overriding need to annotate the features. ↑ Online Etymological Dictionary. Cartography Retrieved December 21, 2007. ↑ Ataman Ministry of Culture. The Oldest Map of the World. Retrieved December 21, 2007. ↑ Oriental Institute, University of Chicago. Nippur - Sacred City Of Enlil Retrieved December 21, 2007. ↑ Detecting the Truth: Fakes, Forgeries and Trickery. Map Imitations www.collectionscanada.ca. Retrieved December 21, 2007. ↑ Harvard Graduate School of Design, 2005. .Retrieved February 29, 2008. Belyea, B. 1992. Amerindian Maps: the Explorer as Translator. Journal of Historical Geography 18(3) :267-277. Bender, B. 1999. Subverting the Western Gaze: mapping alternative worlds. In The Archaeology and Anthropology of Landscape: Shaping your landscape, (eds) P.J. Ucko & R. Layton. London: Routledge. Crawford, P.V. 1973. The perception of graduated squares as cartographic symbols. Cartographic Journal 10(2):85-88. Harley, J. B. and David Woodward (eds) The History of Cartography Volume 5: Cartography in the Nineteenth Century. Chicago and London: University of Chicago Press. Harley, J.B. and David Woodward (eds) The History of Cartography Volume 4: Cartography in the Twentieth Century. Chicago and London: University of Chicago Press. MacEachren, A.M. Some Truth with Maps: A Primer on Symbolization & Design. University Park: The Pennsylvania State University, 1994. Imus, D. and Dunlavey, P. 2002. Back to the Drawing Board: Cartography vs the Digital Workflow. MT. Hood, Oregon. Oliver, J. 2007. The Paradox of Progress: Land Survey and the Making of Agrarian Society in Colonial British Columbia. In Contemporary and Historical Archaeology in Theory (eds) L. McAtackney, M. Palus & A. Piccini. Oxford: BAR, International Series. Phillips, R. 1980. A Comparison of Color and Visual Texture as Codes for use as Area Symbols on Relief Maps. Ergonomics. 23, pp. 1117-1128. Rice, M., Jacobson, R., Jones. D. 2003. Object Size Discrimination and Non-visual Cartographic Symbolization. CA. pp. 1-12. Robinson, A. R. Sale, J. Morrison. 1978. Elements of Cartography. John Wiley and Sons: New York. ISBN 0-471-01781-7. OpenStreetMap : project aimed at creating and providing free geographic data such as street maps to anyone who wants them. Map history has extensive links to online map resources, including several large collections of images online and articles on the history of cartography. This page was last modified on 16 January 2017, at 17:33.